A couple of years ago I was visiting Tito’s Museum here in Belgrade and I snapped this photo while taking the tour. There was an exhibition of Tito’s love of hunting. The exhibit had hundreds of weapons and videos and photos of Tito and his buddies, hunting and enjoying the outdoors. One of the photos (above) showed Libyan leader, Muammar Gaddafi, checking out one of Tito’s pieces. Tito died 30 years ago, but the then young man Gaddafi, is still in power. He is certainly in great peril of losing his grip on Libya and is in the news quite often recently. Tito founded the non-aligned nations movement which Libya was a part of. Today the countries still have a good relationship. I met a bunch of young Libyans a few months ago at the Delta City Mall. These girls are studying at the University of Belgrade. They were nice and surprised that I knew the capital of Libya and a bit about the history of the country. They mentioned they didn’t like the cold weather of Belgrade. 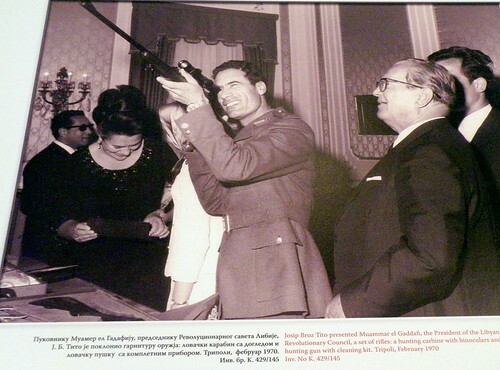 I wonder what Muammar has to say about his visit to Yugoslavia captured in the photo above.